Training for professional, domestic and occasional chainsaw users. 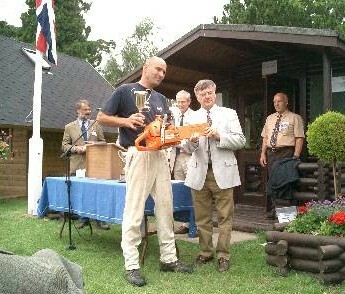 Phil Dunford receiving first prize for the 2005 Welsh Treefelling Championship. Phil instructs on all courses, offering high quality chainsaw training, with courses tailored to fit individual needs. We are a small business and pride ourselves in a offering a personal and friendly service. If you have any questions about chainsaw training, don't hesitate to ring! Phil has twice won the British Chainsaw Championship and seven times the Welsh Treefelling Championship - so IF YOU WANT THE BEST, THEN TRAIN WITH THE BEST!